A Cairo criminal court acquitted on Thursday 40 NGO workers who had previously been sentenced to prison in a high-profile case that had strained US-Egyptian relations. In 2013, an Egyptian court sentenced 43 Egyptian and foreign employees of non-governmental organisations (NGOs) in Egypt to prison terms ranging from one to five years and ordered their organisations closed after they were convicted of operating without licences and illegally receiving foreign funds. In April, the country's top appeals court overturned the prison sentences of 16 of the employees and ordered a re-trial. 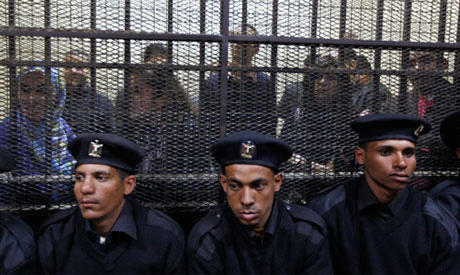 A judicial source told Ahram Online that the rest of the defendants acquitted on Thursday had also appealed against their sentences. Most foreign defendants in the case, which began in 2012, were able to leave the country in the same year after the authorities had lifted a travel ban against them and they were sentenced in absentia. They included nationals of the US, Germany, Serbia and Arab countries. The groups include pro-democracy and human rights organisations of the US-based International Republican Institute (IRI), the National Democratic Institute (NDI) and Germany's Konrad Adenauer Foundation.